Montgomerie of Camas - AKC Scottish Terriers: "Kaytee"
Kaytee was a black/brindle who was sweet, but her life was cut too short. Kaytee died after her 1st litter was 3 days old, very suddenly of a cerebral hemorrhage. We were able to save her litter. None of Kaytee's parents or litter mates had this happen. 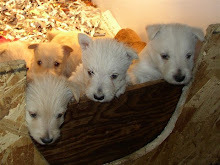 Fortunately we had two others whose own litters were a week older. The pups were healthy & grew up with new mothers & siblings.